The next opportunity to apply is now open, improving on a successful launch in 2017. Ellevate Squads are small, diverse groups of like-minded women at the same stage in their career. 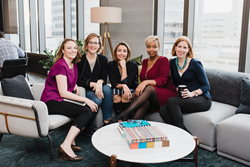 The team has been hard at work creating an original online product that facilitates connections, provides diverse perspectives and resources for the women involved, and as always, uses the power of community to allow professional women to make a mark on the business world in their own unique way. Ellevate Squads are small, diverse groups of like-minded women at the same stage in their career. In the twelve-week program, participants spend 30 minutes each week video conferencing with these driven, intelligent women - it’s the best way to get the support and insight professional women need to get to the next stage of their career. Local and Global Squads, for women in one location or women spread across continents, each with more day and time options for weekly meetings. Brand new resources and tools, including a comprehensive Information Center, new curricula, and preparation worksheets, to maximize impact of the program. Squads applications are currently open and close on March 7th. New Squads will start meeting on April 1st. You can submit your application here. If you’re interested in learning more about the newest version of the Squads program, read this article. To learn more about how Ellevate Network works to close the gender achievement gap in business, click here.